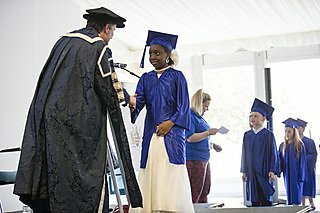 Children from across Devon and Cornwall have graduated after completing hundreds of hours of extra-curricular learning activities. 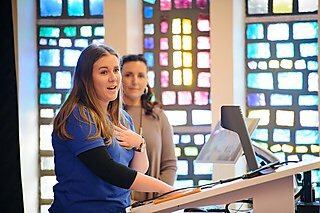 More than 200 young people joined their families and teachers at a series of events organised by the Devon and Cornwall Children’s University, managed by the University of Plymouth. 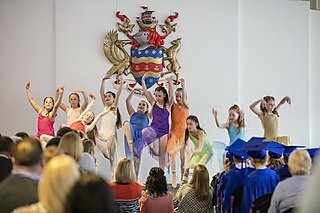 The Children’s University is open to those aged five to 14 and aims to raise aspirations, self-esteem and confidence, while encouraging curiosity and a love of learning. Through it, children are encouraged to take part in clubs and activities outside of school hours and record their achievements on a Passport to Learning. The more they then learn the greater reward they earn, starting with a Bronze Award for 30 hours of activities up to a Gold Fellowship Award for 1,000 hours. Two graduation ceremonies were held on the University of Plymouth’s main campus, followed by another on the Penryn campus of the University of Exeter. The University of Plymouth has coordinated Children’s University activities in Devon for several years and recently took over management of the organisation in Cornwall as well. There are currently more than 100 schools participating across the two counties.